synchronized sound (which that release (re-)introduced to the cartoon world), Steamboat Willie couldn't have had anywhere near the impact it did if Disney hadn't already spent years honing his ability to connect with an audience. The "Alice" series was where a great deal of that skill was developed. The first of them, Alice's Wonderland (only nominally related to Disney's similarly-titled later feature), was made in 1923, before Disney even brought his operation to Hollywood. He was still in Kansas City, producing cartoons for local use, when he decided to replace the faltering Laugh-O-Grams series (which had no continuing characters) with a new one, combining animation with live action the way New York's Fleischer studio had been doing for several years with Koko the Clown. 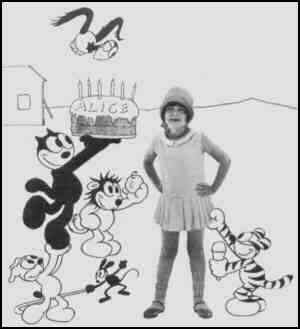 Six-year-old Virginia Davis played Alice, who, after visiting an animation studio, had a dream about taking a train to Cartoonland. But his distributor went bankrupt, tying up rights to the film, and it was never released to theatres. (Decades later, it was used as an introduction to cartoon video releases.) Disney took off for California, where he hooked up with a new distributor, Margaret J. Winkler, who agreed to pay on delivery (important to Disney's shaky finances) for a trial run of a half-dozen short subjects starring Alice. The first of them, Alice's Day at Sea, was released nationwide on March 1, 1924. Winkler insisted on retaining Virginia Davis, whom she considered perfect for the role, and Disney succeeded in convincing the Davis family to move. Others he imported from Kansas City for the "Alice" comedies include Ub Iwerks (Flip the Frog), Hugh Harman and Rudy Ising (Bosko). His brother Roy, who became treasurer of the company, was already there, still recovering from a World War I injury. The comedies proved a success, and the contract was extended. Eventually, 56 "Alice" comedies were released. The second "Alice" release, Alice's Spooky Adventure (April 1, 1924) re-introduced a character who had been seen in some of the old Laugh-O-Grams, a cat who didn't have a name at first but later became known as Julius. He was Disney's first ongoing animated character, the precursor of Donald Duck, Humphrey Bear, The Little Mermaid and all the rest. Julius was Alice's co-star in most of the 1924 releases, and all from 1925 on. Another continuing character from the "Alice" comedies was the villain Bootleg Pete. Under a variety of names, Pete stuck around after "Alice" ran its course, and in fact, is still in use even today. Meanwhile, Winkler married Charles Mintz, who took over the running of her business. Mintz wasn't much interested in characterization, and mandated a steady stream of jokes. Nonetheless, the studio's ability to inject personality into its characters improved steadily during Alice's run; and it was that skill, as much as anything else, that led to its later success. It was also Mintz who pushed Disney into the gradual transformation of Julius into a clone of animation's reigning superstar, Felix the Cat (which probably contributed to Disney's lack of interest in using Julius in later cartoons — he's one of the few series characters Disney ever dropped completely). After a couple of years, audiences grew tired of Alice, and she was replaced by an all-animation series starring Oswald the Lucky Rabbit. The last one was Alice in the Big League, which came out August 22, 1927. The "Alice" comedies will always be remembered as the first nationally-distributed animation by a man who went on to greatness, but as a continuing project, they are gone, gone, gone. Text ©2005-10 Donald D. Markstein. Art © Walt Disney Productions.